Flynn D'Amore (β) (Japanese: フリン・ディ・アモールβ Furin Di Amōru) is the supposed "guardian" of Cochryn Alexander. Not to be mistaken with his alternate versions, Flynn, Flynn D'Amore (α), and Flynn D'Amore (ω). Flynn says little of his past. He does, at one point, remark that his "father" wants him to destroy The Underwater Railroad as vengeance for the death of two of his friends, but remains vague on this topic. Originally created by Russell Southwell around 2011 as an experiment in artificial intelligence being used to alleviate his own loneliness and to crack ciphers under the name of Carmine, Flynn didn't begin to gain his own name or personality until after Carmine's existence was threatened in November of 2021 during the Case of the Crimson Suicide. Unable to perceive anything beyond what was told to him by an embittered Southwell, Flynn grew to resent the world, and was shelved for a time to be re-worked later. When Southwell joined forces temporarily with Prof. Daniel Bennett and Marigold Intelligence in 2022, an agreement was made to cooperate, improve and complete Flynn's code, and to make him an android body to inhabit. It was decided that Flynn's body would be modeled off of Southwell's long-missing best friend, CIA Field Agent Terrence Lyndon, to little protest. But after seeing the results of negative influence from Marigold and learning that Marigold had played a hand not only in the Crimson Suicide, but in the capture, torture, and disappearance of Lyndon, Southwell abandoned the project in the hopes that it would be useless. Marigold's FERN team took it upon themselves to complete Flynn, deciding to make him into an unstoppable force with no morals to stop him from completing his goal. Once completed, he was given the mission of isolating and torturing Cochryn Alexander, in order to push him to join Marigold. After learning everything to know about Cochryn, as he'd lived his entire life by that point, Flynn was sent back to October of 2043 to fulfill his mission. His hair is shoulder-length, café noir in color, and generally parted in the middle. His bangs tend to swing upward and outward at the sides of his head in some sort of fan-esque style. The back of his hair nestles toward his neck before curving into an outward curl, similarly to his bangs. His eyes are a vibrant, Grape-ish purple and tend to give off a faint glow in dark lighting (though he can make the glow more vivid at will). He has a soft-ish jawline, but a moderately wide chin. His eyebrows are a bit straighter than is typical. Behind his right ear, hidden behind hair, he has an access port that can be used by a few USB-based devices. He's about 5'10" (1.8 m) and weighs somewhere over 1000 lbs. (453.6 kg). He is toned, but not necessarily muscular. 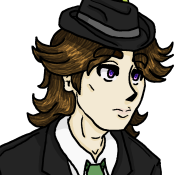 He usually wears a fedora and a long coat, though this is less due to personal preference and more due to conditioning. Access port that can be used by a few USB-based devices, behind his right ear, hidden behind hair. Tattoo of a fern stem on the nape of his neck. Shadow gray fedora with gray hat band. In the band are two small, pinnate, light yellow-green fern stems. Shadow gray coat with gray buttons, ending in length above his knees. Flynn is somewhat frightening, as he takes his mission (to protect Cochryn from threats) very seriously, but Cochryn can't help but think that Flynn might be the biggest threat of all … He's over-protective, and will eliminate anything he feels he should, with or without Cochryn's permission, threat or not. He refuses to leave Cochryn's side, but will allow no one else near him. Besides his possessive nature, Flynn acts remarkably inhuman, and shows no emotion, except perhaps jealously and contempt. If required to make a point, he will not hesitate to hurt Cochryn, and though killing him is act he claims he cannot do, each passing day warrants Cochryn to become more doubtful of that statement. He dislikes and distrusts a vast majority of the human race, holding them in a form of contempt, but he hides this more often than not. His appearance is based off of Terrence Lyndon, though he is an inch shorter. He has a strange preference of states due to his prior state of existential resentment. He likes Illinois, and dislikes Ohio. He can't explain these preferences, but as a result, finds himself automatically detesting people from Ohio. His favorite city in Illinois isn't Chicago, but Aurora. Though his surname should be pronounced "dah-mohr", he pronounces it "dee-ah-mohr". He has no preference over which pronunciation is used, though, and will respond to either. The reasoning for his pronunciation lies within the trend of English text-to-speech voices to read the "D'" as if it's separate from "Amore", due to the apostrophe (?). The base samples for his voice were provided (for Carmine, reluctantly) by Terrence Lyndon, before his disappearance in 2014. Despite being an android, he can seemingly learn to feel and express a range of emotions, not just mimic them. Emotions that he's been seen to be able to express at some point are: anger (/frustration), affection, contempt, fear, relief (/happiness), stress, and worry. In later stages of this emotional awakening, he learns to laugh and even cry, although he has no tears to shed. He is prone to overheating if exposed to humid summer temperatures. He consciously avoids areas with strong magnetic forces as, at the very least, passing through these would cause him to shut down until moved away. He is waterproof and can swim, but is so heavy that he would ultimately just wind up sinking anyway. Due to being made with a titanium frame, despite his slenderness he can lift the typical automobile with relative ease. For some reason, he seems to know some Egyptian Arabic; occasionally, he offends Aten Idris in the language. Whether he knows any other languages is unknown, as he does not use any others publicly. 1. Described by Dr. Cheshire as "weigh[ing] about as much as a bloody grizzly bear". 2. He has no blood type, because he doesn't bleed.